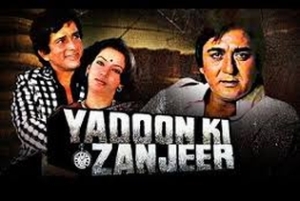 Yaadon Ki Zanjeer is a social film released in 1984. The film is directed by Shibu Mitra and produced by Hans Choudhry. The cast includes Sunil Dutt, Shashi Kapoor, Reena Roy and Shabana Azmi as lead actors. The story is about two brothers who are separated after a gang kills their father. The film takes a turn when one of the brothers joins that same gang, while the other joins the police.